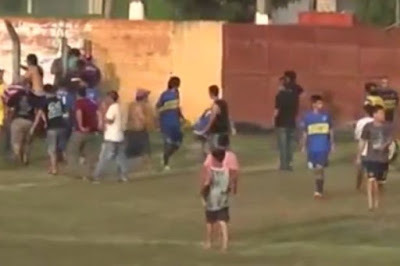 A referee was attacked and beaten by thuggish football supporters in a violent clash between team rivals. They launched their ambush immediately after a contentious penalty kick had been scored. And the attack eventually sparked a mass brawl between the teams and fans on Saturday. 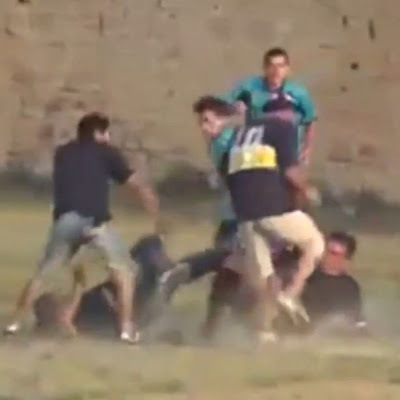 The brawl was sparked when visiting Primero de Mayo scored a penalty to win the match at the San Luis stadium in Argentina. The referee was ambushed and beaten as they then rained blows on him before he was helped to his feet by officials. The Clorinda Football League will meet to discuss the incident and decide what punishment will be handed out.